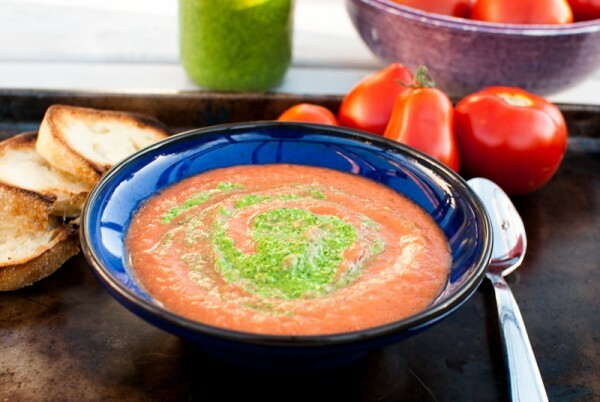 There is nothing that tastes more juicer and delicious than a tomato from your own garden! 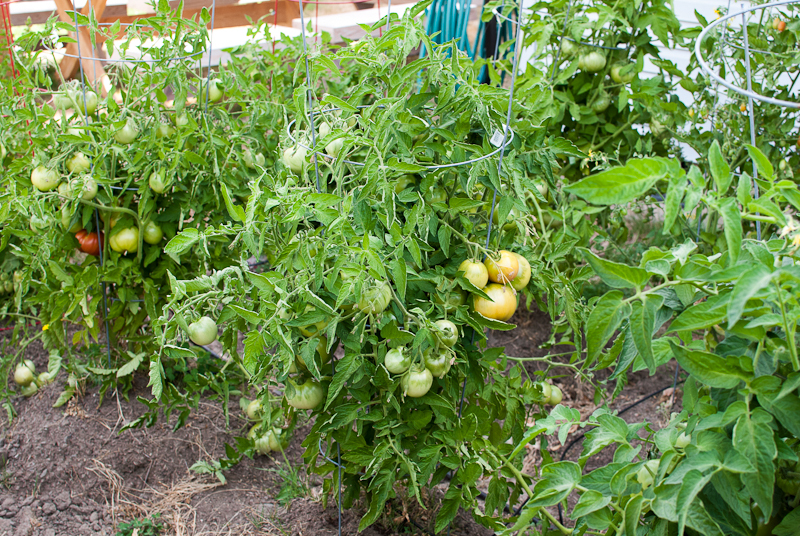 They are brighter and juicer than any store bought tomato and….you know you grew it in your own garden organically! Picked right off the vine and ready to eat….now that’s what I call summer in the Northwest! 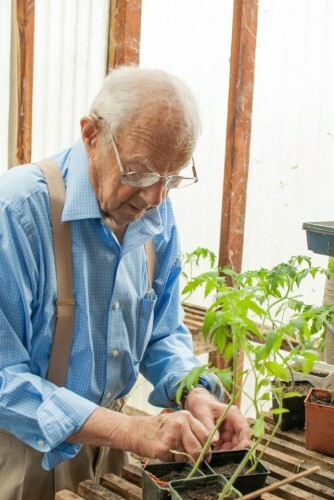 Grandpa and his tomato starts! 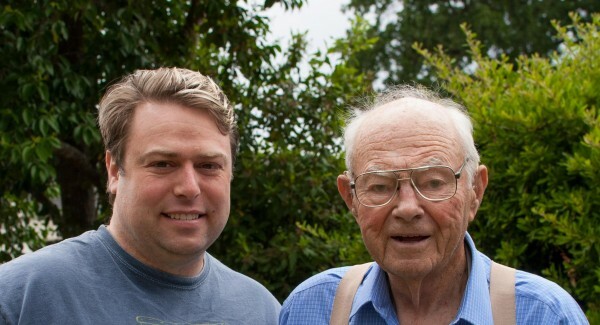 Andrew and his 90 yr old Grandpa! So what to do with all these tomatoes? They are ripening faster than we can eat them…but I’m not complaining! 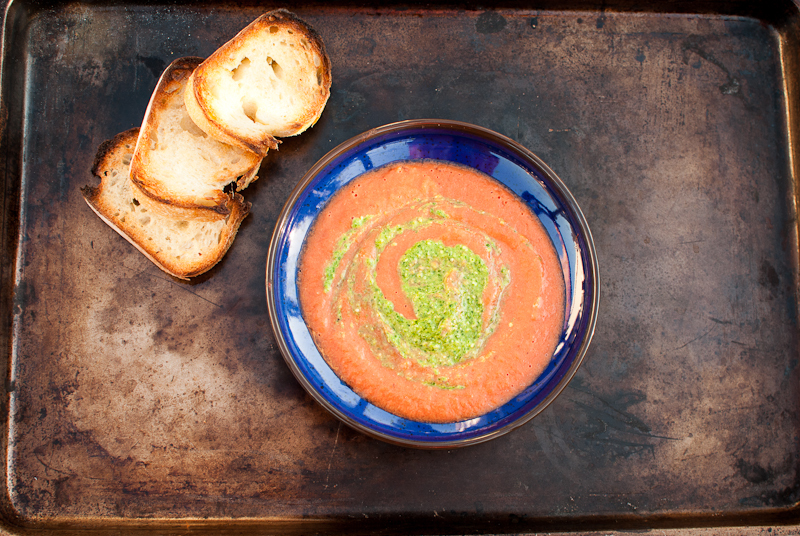 We are going to make and can salsa at the end of the season, and also tomato sauce, but for now while we wait for the rest, I made an easy delicious summer tomato soup with an arugula pesto. Even my daughter said this was the best tomato soup ever! You could throw this together easily one evening after work for a light dinner. All the cooking is done in the oven, I cut the tomatoes into quarters and drizzled olive oil, some salt and pepper over them and placed them on a baking sheet for 30 minutes. While that was roasting, I made the arugula pesto in 5 minutes and had a glass of wine for the other 20 or so minutes ;) I really believe the quality of tomatoes makes this dish. 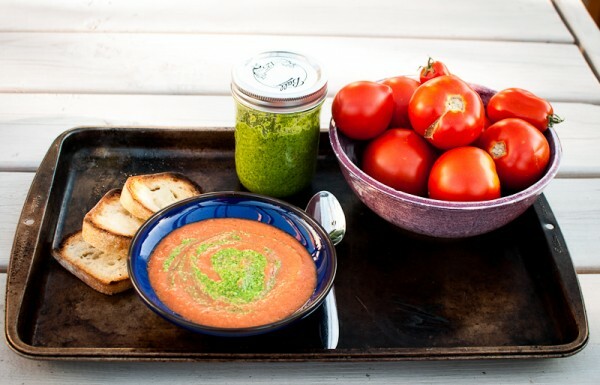 If you use the store bought tomatoes it may not have as much flavour and if you don’t have a garden, head over to your farmer’s market and pick up some fresh tomatoes. Also a bonus for this recipe, you will have a lot of pesto leftover to use on another dish later in the week! Cut tomatoes into quarters and remove middle core. Drizzle olive oil, salt and pepper over the tomatoes, place on a lined baking sheet. While those are roasting, saute garlic and shallots in a little olive oil over medium low heat for 15 minutes. Set those aside until the tomatoes are done. When tomatoes are done and cooled enough to handle, peel the skins off and place in a blender. The skins should come off very easily. Add to the blender the sauteed shallots and garlic, milk, salt and sugar. Toast the pine nuts until golden brown, about 4 minutes over medium heat. In a food processor, combine the pine nuts, arugula, garlic, salt, lemon juice and parmesan cheese. While running on low, slowly add in the olive oil and mix until combined, about 2 minutes. Pesto yields about 12 oz, and the soup yields about 4 main servings, or 6 side servings. The soup can also be eaten cold. Top a small amount of pesto on the soup and serve.